When: Winter Solstice December 21st, 2013 at 7:00 P.M (your time) in whatever country you are in. We will be building on the momentum of the Winter Solstice as been suggested by God and desired by many people who have been contacting us. We will be working with the solstice to firmly solidify the continuous outpouring of the energetic movement originally Created during the Autumn Project “PUSH.” Together we can better help ground the coming year of 2014. With the original PUSH movement we started an energy wave effect that is still ongoing and picking up speed, so it makes perfect sense to keep the momentum going. The difference this time around is we are asking everyone to have clearly defined concepts of what they want to bring into manifestation in 2014. No broad unrealistic ideas; concentrate on what you feel are the most meaningful changes, which means personal as well as planetary, that you resonate with the most. Yes this will also aid in further removing dark energy streamers because dark cannot tolerate the Light. So, because of the massing of heart, mind and Soul of those who participate, you will be each shine a broad spectrum of Light throughout the planet and beyond. You each learned from the initial PUSH movement the hand motions, the composure you need and the dedication to make a difference by Be-ing the difference. We suggest that you spend quality time between now and then to read the original text which accompanies the video showing you how to perform the movements. This will ensure for you that yes you are doing it correctly and also allows you to flow more with the motions. This will increase your self-confidence and be a catalyst to expand your higher form of consciousness. You will not make a mistake and you can do no wrong. We are asking everyone who participates to use your share button on Facebook, Twitter, your websites, your email contact list etc. and connect with others who also want to bring in the best of the best of changes for 2014 and beyond. We want you to understand that this will accelerate organized chaos across this world which will also help to expose the dark people and dark plans, organizations, places and events to the Light. Much will come into public awareness when the masses finally realize they have been duped for centuries and centuries. 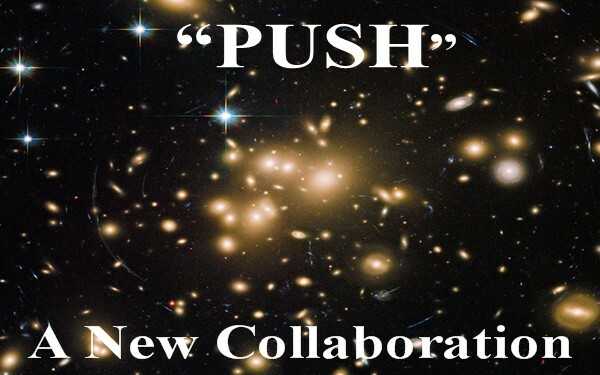 So you see, the purpose of “PUSH: A New Collaboration” is multifold. The difference this time around is that we ask you to use your PUSH technique to clear away any and all obstacles that you foresee which may try to dampen the impact. Once you have successfully PUSH-ed them away, THEN bring in your intents. You may take as much time as you desire this time around for defining what you feel is important to be added into this movement. Be relaxed with what you do, there is no pressure being placed upon you. You are each the Masters and Mistresses of your own Destiny. So become comfortable with yourself. If you are in a public place at that 7:00 P.M. time, simply go to the restroom or some other quiet place and PUSH from there. One enterprising woman had her adult children and her grandchildren at her home during the initial PUSH so she closed herself in the bathroom and PUSH-ed. Be Creative!!! There’s a place up ahead and I’m goin’ Just as fast as my feet can fly Come away, come away if you’re goin’, Leave the sinkin’ ship behind. CHORUS: Come on the risin’ wind, We’re goin’ up around the bend. Bring a song and a smile for the banjo, Better get while the gettin’s good, Hitch a ride to the end of the highway Where the neons turn to wood. You can ponder perpetual motion, Fix your mind on a crystal day, Always time for a good conversation, There’s an ear for what you say. Catch a ride to the end of the highway And we’ll meet by the big red tree, There’s a place up ahead and I’m goin’ Come along, come along with me.